PARIS/SYDNEY, April 29 (Reuters) - U.S. soybean futures rebounded as traders took the view that selling earlier in the week had been overdone, while corn and wheat extended gains on concerns about the slow pace of U.S. planting. "After the big sell-off, there's some buying back-in while there's still sowing delays in the United States that's helping to support prices," said Pat Cogswell, a trader at MF Global Australia. KUALA LUMPUR, April 29 (Reuters) - Malaysian crude palm oil futures gained 1 percent, bouncing off one-week lows earlier in the session, as investors shifted focus from swine flu to expectations of higher demand. "Perhaps we are getting back to our own fundamentals of higher demand and tight stocks. We had a healthy correction and now its time to jump back in," one dealer from a local commodities broker said. BEIJING/SINGAPORE, April 29 (Reuters) - Chinese soybean buyers have cancelled up to five U.S. soybean cargoes in the past few days because plentiful imports are squeezing crushing margins, traders said on Wednesday. "We heard some 4-5 cargoes for June, July and August shipment were cancelled. Crushing margins have fallen a lot recently," said one Beijing-based trading manager with an international trading house. SINGAPORE/BEIJING, April 29 (Reuters) - China's relentless soybean imports have caused an oversupply in the domestic market and the situation may worsen in the months ahead as plentiful shipments are in the pipeline. With domestic crush margins softening, Chinese importers have cancelled up to five cargoes and signed no orders for new purchases this week, traders have said. KUALA LUMPUR/JAKARTA, April 29 (Reuters) - Growing economic pain may increasingly force consumers to turn to palm oil, one of the cheapest cooking oils, a move that could scupper nascent plans to slow deforestation in Southeast Asia. With rising output in Indonesia, the world's biggest palm oil producer and home to the eighth largest expanse of forests, and tight land supplies in Malaysia, the world's second largest supplier, conservation's economics look even less appealing. WASHINGTON, April 28 (Reuters) - North American pork products were hit with bans in the wake of an outbreak of a new swine flu strain, even though health officials said consumers could not contract the virus by eating pork. The virus has killed about 150 people in Mexico, and has made 65 people ill in several U.S. states. It also has spread to Canada, Europe, the Middle East and New Zealand. April 30 (Bloomberg) -- Crude oil was little changed after a government report yesterday showed inventories of the fuel climbed, while gasoline inventories posted an unexpected drop as refiners reduced operating rates. Gasoline supplies declined 4.7 million barrels to 212.6 million last week, the biggest reduction since September, the Energy Department said. Stockpiles were forecast to climb by 200,000 barrels, according to a Bloomberg News survey. Prices also increased after stocks rallied and the dollar fell. Crude oil for June delivery fell 30 cents, or 0.6 percent, to $50.67 a barrel at 9:07 a.m. Sydney time on the New York Mercantile Exchange. In New York trading yesterday, June futures rose $1.05 to settle at $50.97 a barrel. Prices are up 14 percent this year. Refineries operated at 82.7 percent of capacity, down 0.8 percentage point from the prior week. Analysts forecast that operating rates would climb 0.2 percentage point. Inventories of crude oil rose 4.05 million barrels to 374.7 million in the week ended April 24, the report showed. The gain left supplies the highest since September 1990 and 15 percent greater than the five-year average for the period. Stockpiles were forecast to increase by 1.8 million barrels, according to the median response of 14 analysts surveyed. Inventories of distillate fuel, a category that includes heating oil and diesel, climbed 1.79 million barrels to 144.1 million. A 1-million-barrel gain was forecast. Total daily fuel demand in the U.S. averaged 18.4 million barrels in the four weeks ended April 24, down 6.8 percent from a year earlier, the department said. Consumption of gasoline was down 0.5 percent and distillate use was 11 percent lower. U.S. stocks rose, pushing the Standard & Poor’s 500 Index toward its best month since 2000, as companies beating profit forecasts outnumber those that trailed 10-to-1. The S&P 500 climbed 2.2 percent to 873.64. The Dow Jones Industrial Average increased 2.1 percent to 8185.73. Equities markets remained higher after the Federal Reserve said the “economic outlook has improved modestly” since March. The Fed kept the federal funds target rate at a range of zero to 0.25 percent for the third straight meeting and repeated its intentions to keep the benchmark low. The dollar fell 0.8 percent to $1.3252 per euro yesterday, from $1.3149 a day earlier. Consumer confidence in the U.S., the world’s biggest oil- consuming country, jumped more than forecast in April. The Conference Board’s sentiment index climbed to 39.2, the highest level since November, from 26.9 in March, the New York-based research group said earlier this week. The Commerce Department reported yesterday that the U.S. economy plunged in the first quarter, capping its worst performance in five decades. Gross domestic product fell at a 6.1 percent annual pace, the department said. Crude oil in New York has traded between $43.83 and $53.90 this month as inventories climbed and equities rebounded on speculation the economy will recover later this year. “The energy markets are range-bound and lurching from news story to news story,” Sieminski said. The Organization of Petroleum Exporting Countries will keep all options open, including a production cut, before its meeting next month, Shokri Ghanem, Libya’s top oil official, said yesterday in an interview in Nicosia, Cyprus. The group meets May 28. OPEC agreed to slash production by 4.2 million barrels a day from September levels to bolster prices. Brent crude for June settlement rose 79 cents, or 1.6 percent, to end the session at $50.78 a barrel yesterday on London’s ICE Futures Europe exchange. April 29 (Bloomberg) -- Corn and soybeans rose the most this month on speculation that the swine-flu outbreak will be less disruptive to demand for food, animal feed and fuel made from the biggest U.S. crops than initially expected. Corn and soybeans fell earlier this week as the swine-flu outbreak expanded from Mexico to the U.S. and at least six other nations, threatening an economic recovery. President Barack Obama asked Congress for $1.5 billion to combat the outbreak. The flu is different from seasonal varieties that hospitalize 200,000 Americans a year, with about 36,000 fatalities, according to the Centers for Disease Control. Corn futures for July delivery rose 17.75 cents, or 4.6 percent, to $4.0125 a bushel on the Chicago Board of Trade. The price has dropped 34 percent in the past year. Soybean futures for July delivery rose 42 cents, or 4.3 percent, to $10.25 a bushel in Chicago. The price fell 4.9 percent in the previous two days on speculation that swine flu would cut demand. The most-active contract touched a three-month high at $10.645 on April 17 on increased buying by China, the biggest hog producer. Today’s gains for both soybeans and corn were the biggest since March 31. Corn and soybeans also rose on increased speculative buying tied to perceptions that the worst of the economic slowdown may have passed, increasing demand for commodities. U.S. stocks rose for the first time in three days as banks advanced after London-based research company Fox-Pitt Kelton Cochran Caronia Waller’s first upgrade of the U.S. industry since 2004. The Standard & Poor’s 500 Index has rallied 29 percent since March 9 as investors speculated U.S. Treasury Secretary Timothy Geithner’s plan to finance the purchase of as much as $1 trillion in illiquid assets from banks will help to pull the global economy out of a recession. Crude oil rose as much as 3 percent as the dollar fell against most major currencies, increasing the appeal of commodities an investment to hedge against inflation, said Mike Zuzolo, the president of Risk Management Commodities Inc. in Lafayette, Indiana. Soybean prices accelerated higher after the Buenos Aires Cereals Exchange cut its forecast for Argentina’s harvest to 34 million metric tons, from last week’s forecast of 36.2 million, because of drought. Argentina, the third-largest exporter after the U.S. and Brazil, harvested 46.2 million tons last year. Brazil’s crop will total 57 million tons, down from 61 million collected last year, the U.S. Department of Agriculture said April 9. Combined production in Brazil, Argentina, Paraguay and Bolivia will likely fall below 97 million tons, compared with 115.5 million harvested last year, said Chip Flory, editor of the Professional Farmers of America newsletter in Cedar Falls, Iowa. U.S. soybean export sales to China since Sept. 1 rose 37 percent from a year earlier, USDA data show. U.S. supplies on Aug. 31, before the next harvest, will drop 20 percent from a year earlier to 165 million bushels, the lowest since 2004, the USDA said earlier this month. Corn is the biggest U.S. crop, valued at $47.4 billion in 2008, with soybeans in second place at $27.4 billion, government figures show. April 29 (Bloomberg) -- Gold prices rose for the first time in three days as the U.S. economy’s slump drove the dollar lower, enhancing the appeal of the precious metal as an alternative investment. Silver also gained. Gross domestic product plunged again in the first quarter, capping the worst U.S. performance in five decades amid a record slump in inventories and further declines in housing. Gold climbed 5.3 percent last week, while the dollar has dropped in six of seven sessions against a basket of major currencies. “The abysmal GDP data for the first quarter dented the dollar and sent a fresh platoon of safe-haven buyers toward the shining shelter offered by gold,” said Jon Nadler, a senior analyst at Kitco Inc. in Montreal. Gold futures for June delivery rose $6.90, or 0.8 percent, to $900.50 an ounce on the Comex division of the New York Mercantile Exchange. Gold dropped 2.2 percent in the previous two days. The metal has gained 1.8 percent this year. Silver futures for July delivery advanced 34.9 cents, or 2.8 percent, to $12.775 an ounce. The metal has climbed 13 percent this year. The GDP report was released hours before the Federal Reserve announced it had refrained from increasing purchases of Treasuries and mortgage securities, saying that the economy is showing some signs of stability. The central bank’s Open Market Committee issued a statement after a two-day meeting. Gold has fallen 2.6 percent this month, while the MSCI World Index of equities gained 10 percent. FKLI April futures contract rebound 5.5 point higher to close at 972.5 as compare to previous trading session with total 5,601 lots traded in the market. FKLI price rebound tracking closely to Dow Jones electronic trading. Technically, FKLI complete 123.6% Fibonacci projection at 959 levels and starts rebound after 2 – consecutive days of bear rally. 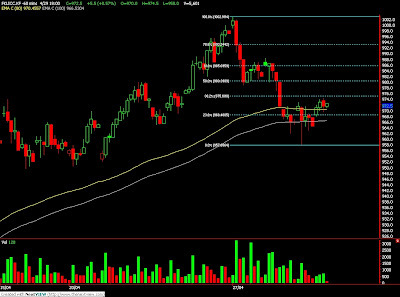 We expect FKLI would rebound towards resistance levels at 980 and 986 regions; 50% and 61.8% Fibonacci retrace levels. Traders were advice to hold fresh short position around resistance levels while be alert around support levels at 963 and 959 regions. FCPO 3rd month July Futures contract rebound RM24 higher to close at RM2480 as compare to previous trading session with 13,014 lots traded in the market. CPO price traded higher from the low as soybean oil and crude oil electronic trading surge up during the trading session. Technically, CPO price seems double bottomed around RM2420 regions and manage to break up from the falling wedge around previous resistance levels at RM2470 regions. We expect CPO price would rebound higher in the coming trading session with nearest resistance levels seen at RM2502 and RM2530 regions. Traders were advice to hold short position in the coming trading session while be extra alert around support levels at RM2450 and RM2400 regions. MUMBAI, April 29 (Reuters) - Indian soyoil and soybean futures fell on Wednesday morning tracking weakness in Malaysian palm oil and expectation of lower demand following an outbreak of swine flu, analysts said. At 10:59 a.m, the June soybean contract NSBM9 on the National Commodity and Derivatives Exchange fell 0.32 percent to 2,613 rupees per 100 kg. The June soyoil contract NSOM9 was at 493 rupees per 10 kg, down 0.45 percent. Rapeseed futures edged up on expectation of lower arrival. The June rapeseed contract NRSM9 rose 0.44 percent to 522.6 rupees per 20 kg. At 10:00 a.m. the benchmark July palm oil futures KPOc3 on Bursa Malaysia Derivatives Exchange was down 1.71 percent at 2,414 ringgit a tonne. The swine flu has lowered the meat consumption, affecting soymeal demand, which is mainly used as cattle and poultry feed. April 29 (Bloomberg) -- The yen fell against the dollar for the first time in more than a week before a U.S. report that may show the world’s largest economy shrank at a slower pace, reducing demand for the safety of the Japanese currency. The yen also weakened versus all of the 16 most-active currencies as Asian stocks rose, reviving confidence among investors to buy higher-yielding assets. Gains in the euro may be limited on concern disagreement is deepening among European Central Bank officials on measures needed to combat the 16- nation region’s recession. The yen declined to 127.41 per euro as of 9:50 a.m. in Singapore from 126.79 in New York yesterday. The currency fell to 96.89 against the dollar from 96.45. The euro traded at $1.3150 from $1.3149 yesterday in New York. Europe’s single currency dropped to 86.67 British pence from 89.86 pence. Australia’s dollar rose to 71.08 U.S. cents from 70.62 cents and climbed to 68.86 yen from 68.10 yen yesterday in New York. New Zealand’s dollar advanced to 56.35 cents from 55.88 cents and strengthened to 54.60 yen from 53.90 yen. Benchmark interest rates are 3 percent in New Zealand and Australia, compared with 0.1 percent in Japan and as low as zero percent in the U.S. attracting investors to the South Pacific nations’ higher-yielding assets. The risk in such trades is that currency market moves will erase profits. The volume of currency trading is likely to be less than normal because of a national holiday in Japan, said Sean Callow, senior currency strategist at Westpac Banking Corp. in Sydney. The Dollar Index was little changed. The U.S. economy probably contracted at an annual rate of 4.7 percent in the first quarter, after shrinking 6.3 percent in the final three months of 2008, according to a Bloomberg News survey. The Commerce Department releases the data at 8:30 a.m. in Washington. The New York-based Conference Board said yesterday its consumer confidence index climbed to 39.2 this month, the highest level since November, from 26.9 in March. The gain in the index was the biggest since 2005. The Federal Reserve will keep its target lending rate in a range of zero to 0.25 percent, a separate Bloomberg survey showed. Policy makers will announce their decisions on interest rates and goals for purchases of Treasuries and mortgage securities at 2:15 p.m. in Washington. The Dollar Index, which the ICE uses to track the greenback against the euro, yen, pound, Canadian dollar, Swiss franc and Swedish krona was at 85.127 from 85.158 yesterday. The yen fell against the Australian and New Zealand dollars for the first time in three days as the MSCI Asia-Pacific excluding Japan Index gained 0.5 percent and Standard & Poor’s 500 Index futures rose 0.3 percent. The VIX Index, a measure of market volatility known as Wall Street’s “fear gauge,” declined 1 percent to 37.95 yesterday, indicating traders are becoming more confident about stock- market advances. The euro may weaken against the dollar on speculation discord is increasing among ECB policy makers over measures needed to counter the recession. ECB Executive Board member Lorenzo Bini Smaghi yesterday devoted much of his speech to highlighting the difficulties for the central bank of buying assets, suggesting he shares Bundesbank President Axel Weber’s view. Weber has said he doesn’t favor cutting the benchmark rate below 1 percent and is against buying assets, while others such as Athanasios Orphanides of Cyprus don’t want to rule those options out. Fellow member Juergen Stark will speak today in Siegen, Germany, and Ewald Nowotny will speak in Vienna tomorrow. Investors maintained bets the ECB will cut its 1.25 percent target lending rate at its next meeting on May 7. The implied yield on the three-month Euribor interest-rate futures contract for June delivery was unchanged from yesterday at 1.280 percent. April 29 (Bloomberg) -- Crude oil fell for a third day on concern that fuel demand will drop as the swine-flu outbreak curtails travel and delays a recovery from the global recession. Oil, gold and copper declined yesterday as the World Health Organization raised its global pandemic alert to the highest since the warning system was adopted in 2005, saying the disease is not containable. Crude rose in eight of the past 10 weeks as the stock market climbed on speculation that the economy and energy consumption would rebound later this year. Crude oil for June delivery fell 55 cents, or 1.1 percent, to $49.37 a barrel at 8:50 a.m. Sydney time on the New York Mercantile Exchange. In New York trading, June futures fell 22 cents to settle at $49.92 a barrel. Prices are up 12 percent this year. Airline stocks tumbled worldwide yesterday. U.S. carriers reported some cases of suspected flu-like symptoms to health authorities, the Air Transport Association trade group said. The U.S. Centers for Disease Control and Prevention recommended that nonessential travel to Mexico be avoided. Air travel in Asia fell after the outbreak of Severe Acute Respiratory Syndrome in 2003. Brent crude for June settlement fell 33 cents, or 0.7 percent, to end the session at $49.99 a barrel on London’s ICE Futures Europe exchange. Nigeria, vying with Angola to be Africa’s biggest oil producer, reduced the official selling prices for its benchmark crude exports in May to the lowest in more than three years. Bonny Light and Qua Iboe prices were cut $1.20 to a premium of 60 cents a barrel over Dated Brent, according to traders with knowledge of the price list compiled by state-owned Nigerian National Petroleum Corp. That is the lowest since January 2006. Nigeria produces low-sulfur, or sweet, crude oil, prized by U.S. refiners because of the proportion of high-value gasoline and distillate fuel it yields. Other commodities dropped on concern that the spread of swine flu will exacerbate the economic slowdown. Yesterday, the Reuters/Jefferies CRB Index of 19 commodities declined 0.97 point, or 0.4 percent, to 217.22. Copper futures for July delivery dropped 6.9 cents, or 3.5 percent, to $1.9165 a pound on the Comex division of Nymex, the lowest settlement for a most-active contract since April 2. An Energy Department report later today will probably show that U.S. crude oil stockpiles rose by 1.8 million barrels last week, according to the median of 14 analyst responses in a Bloomberg News survey. Supplies climbed to 370.6 million barrels in the week ended April 17, the highest since September 1990. Gasoline stockpiles increased 200,000 barrels from 217.3 million the prior week, according to the survey. Inventories of distillate fuel, a category that includes heating oil and diesel, rose 1 million barrels from 142.3 million. After floor trading ended yesterday, the industry-funded American Petroleum Institute reported crude oil inventories rose 4.58 million barrels to 374.8 million last week. The report was released at 4:30 p.m. in Washington. FKLI April futures contract plunge 16 point lower to close at 966 as compare to previous trading session with total 11,754 lots traded in the market. 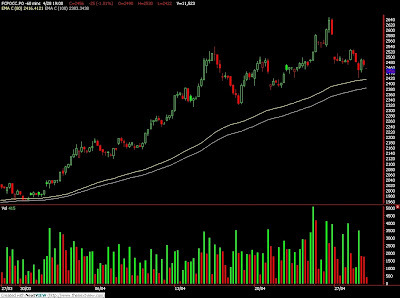 FKLI traded lower together with regional indices and Dow Jones electronic trading plunge during trading session. 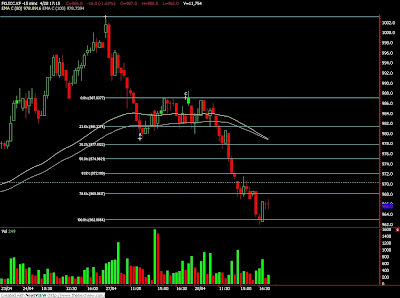 Technically, FKLI plunge after consolidate around 988 and 980 range. We expect FKLI might rebound mildly in the coming trading session with resistance seen at 977 and 987 levels; 38.1% and 61.8% Fibonacci figures. 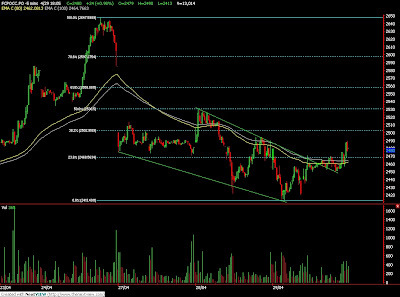 Traders were advice to take profit from recently short position around support levels at 962 and 957 regions while establish fresh short position around resistance levels. FCPO 3rd month July Futures contract fall RM25 lower to close at RM2456 as compare to previous trading session with 11,523 lots traded in the market. CPO price was traded wild during the trading session as soybean oil was traded in large range during trading session. 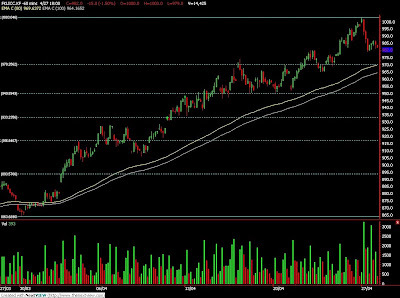 Technically, CPO price seems temporary stopped at 61.8% Fibonacci projection figures at RM2420 levels. We expect CPO price still riding on a bear rally. However, we anticipate mild rebound in the coming trading session with resistance seen at RM2508 and RM2580 regions. Traders were advice to hold short position around resistance levels while eye closely around support levels at RM2400 and RM2350. - Fears of a global swine pandemic grow with new infections in U.S., Canada; 103 dead in Mexico. Dampens talks of recovery. PARIS/SINGAPORE, April 27 (Reuters) - Grain and oilseed markets fell sharply on Monday on concern that a swine flu outbreak in North America could reduce demand. "The drop is related to concerns over the spread of swine flu which could trigger a fall in meat consumption and therefore in animal feed," one French trader said. GENEVA, April 27 (Reuters) - The prompt resolution of a 15-year old dispute over access to U.S. roads by Mexican trucks could be another casualty of the deadly swine flu outbreak, international trade experts said on Monday. Increased health checks to control the virus, which has killed 103 people in Mexico and infected at least 20 in the United States, could also slow the passage of goods across the busy but troubled U.S.-Mexico border, they said. KUALA LUMPUR, April 27 (Reuters) - Asian vegetable oil markets slid on Monday as concerns spread over an outbreak of swine flu in Mexico reduced meat and grains demand. "Hopefully this is a minor hiccup," said S. Paramalingam, executive director of local brokerage Pelindung Bestari. LONDON, April 27 (Reuters) - Oil fell below $49 while copper shed 4 percent on Monday, as most commodity markets were stalked by fear that a deadly flu outbreak spreading from Mexico may become a pandemic and hurt bids to stabilise the global economy. "Equities are weaker and people are getting out of some of the riskier assets and into havens," said David Thurtell analyst at Citigroup in London. LONDON, April 27 (Reuters) - World stocks tumbled after seven weeks of gains and oil and the euro fell on Monday as concerns intensified the spread of swine flu, which has killed more than 100 people in Mexico, would hit the global economy. "The swine flu seems to be one of those 'Black Swan' events that has caught the market by surprise. This is a concern as to whether it might impact any potential... recovery chances," said Martin Slaney, head of derivatives at GFT Global Markets. JAKARTA, April 27 (Reuters) - Indonesian crude palm oil producers do not want to trade the commodity on an exchange, making it harder to establish a benchmark price in the world's top producing country, the head of the exchange said on Monday. The plan to trade CPO on the Jakarta Futures Exchange was intended to create a more transparent benchmark, but a lack of incentives is making it hard to appeal to potential users, Hasan Zein Mahmud, chairman of Jakarta Futures Exchange, told Reuters in an interview. April 28 (Bloomberg) -- Crude oil fell for a second day on concern that the swine-flu outbreak will curtail travel and on forecasts that the U.S. economy will keep shrinking. Oil declined as the World Health Organization weighed whether to raise its pandemic alert to an unprecedented level. The economy in the U.S., the world’s largest oil-consuming country, will continue to contract “for some time,” Lawrence Summers, director of the White House National Economic Council, said earlier this week. Crude oil for June delivery fell 29 cents to $49.85 a barrel at 9:02 a.m. Sydney time on the New York Mercantile Exchange. Prices are up 12 percent this year. Crude futures fell $1.41 to settle at $50.14 a barrel yesterday. WHO plans to say that swine flu is spreading across North America, two people familiar with the agency said. An increase above level 3 on the agency’s six-step alert system would be the first since the current pandemic risk scale was adopted in 2005. Geneva-based organization is the United Nations body that coordinates international public health. U.S. stocks also retreated on concern the swine-flu outbreak will curb travel. The Standard & Poor’s 500 Index declined 1.01 percent to 857.51. The Dow Jones Industrial Average dropped 0.6 percent to 8,025. Airline stocks tumbled worldwide. U.S. carriers reported some cases of suspected flu-like symptoms to health authorities, the Air Transport Association trade group said. The U.S. Centers for Disease Control and Prevention recommended that nonessential travel to Mexico be avoided. The global economy will shrink 1.3 percent this year compared with a January prediction of 0.5 percent growth, according to an International Monetary Fund forecast on April 22. The Washington-based lender predicted expansion of 1.9 percent next year instead of its earlier 3 percent estimate. The dollar increased against the euro for the first time in a week on speculation the European Central Bank will lower interest rates at its meeting next month. The U.S. currency traded 1.7 percent higher at $1.3012 per euro, limiting the appeal of dollar-priced commodities like crude oil as an alternative investment. U.S. crude-oil stockpiles rose 3.86 million barrels to 370.6 million in the week ended April 17, the highest since September 1990, an Energy Department report showed last week. Supplies probably increased 1.8 million barrels last week, according to the median of nine analyst responses in a Bloomberg News survey. Increased output by non-OPEC producers has left the market oversupplied by about 720,000 barrels a day, Algerian Oil Minister Chakib Khelil said earlier this week. Crude-oil prices need to be at $70 a barrel to ensure continued investment in the industry, Abdalla el-Badri, secretary-general of the Organization of Petroleum Exporting Countries, said in Algiers earlier this week. Oil may reach $60 a barrel by the end of 2009, Khelil said. OPEC agreed last year to cut output by 4.2 million barrels and will review production again when it meets May 28. The group has completed about 83 percent of the reductions, the organization’s data show. former oil minister, said in Cairo earlier this week. Brent crude for June settlement fell $1.35, or 2.6 percent, to end yesterday’s session at $50.32 a barrel on London’s ICE Futures Europe exchange. April 27 (Bloomberg) -- Soybean prices tumbled the most in two months, and grain futures fell on speculation that a swine- flu outbreak will curb demand for livestock feed and pork. The World Health Organization will raise its pandemic alert to an unprecedented level today, saying that swine flu is spreading across North America, two people familiar with the agency said. Hog and pork-belly futures plunged 3 cents a pound, the most allowed by the Chicago Mercantile Exchange. Several nations banned pork from Mexico and the U.S. Soybean futures for July delivery fell 37 cents, or 3.6 percent, to $9.97 a bushel on the Chicago Board of Trade. The drop was the biggest for a most-active contract since Feb. 17. The price has dropped 25 percent in the past 12 months. Corn futures for July delivery declined 5 cents, or 1.3 percent, to $3.8075 a bushel. Earlier, the price fell as much as 4.1 percent. The grain has declined 36 percent in the past year. Wheat futures for July delivery declined 23.75 cents, or 4.4 percent, to $5.195 a bushel, the biggest drop since March 25. The price has slumped 36 percent in the past year on increased global production and waning demand for U.S. grain. More than 100 deaths linked to swine flu occurred in Mexico. Cases have been reported in the U.S., Canada, Spain, Mexico and New Zealand. The virus, normally contagious only among pigs, raised concerns that this outbreak may be similar to the spread of the H5N1 bird flu in Asia during the past few years. That disease killed several hundred people and led to the slaughter of millions of chickens and other poultry. The bird-flu virus never obtained the ability to spread easily among people, while the swine flu virus that first appeared in Mexico already has acquired that trait, according to Malik Peiris, a microbiologist with the University of Hong Kong. There is no vaccine to protect people from the disease. “It will probably take at least a couple of weeks before we know the outcome of this disease,” said Dan Basse, the president of AgResource Co. in Chicago. Pandemics occur when a novel influenza A-type virus, to which almost no one has natural immunity, emerges and begins spreading. Consumers have begun to ask supermarkets around the country whether pork can transmit the virus, Ken Goldman, a JPMorgan Chase & Co. analyst, said in a report. Goldman lowered his estimates for Tyson Foods Inc. and Smithfield Foods Inc. earnings this year. China, Russia, Indonesia and the Philippines have blocked imports of pork from Mexico and parts of the U.S. China banned shipments from Texas, California and Kansas, according to the country’s General Administration of Quality Supervision. Corn is the biggest U.S. crop, valued at $47.4 billion in 2008, followed by soybeans at $27.4 billion, government figures show. Wheat is fourth, behind hay, at $16.6 billion. April 28 (Bloomberg) -- The yen rose to the strongest level in more than six weeks against the euro on speculation the spreading swine flu outbreak will increase demand for safety. The Mexican peso slumped the most against the dollar in six months yesterday as the World Health Organization raised its pandemic alert to an unprecedented level, fueling concern the spread of the virus will deepen the global recession. The euro may fall for a second day against the dollar after European Central Bank member Ewald Nowotny said yesterday the bank stands “ready to use unconventional measures of quantitative easing” to improve the flow of credit. The yen traded at 125.42 per euro as of 8:32 a.m. in Tokyo from 126.14 in New York yesterday. It touched 125.34, the strongest since March 12. The yen climbed to 96.30 per dollar from 96.77 yesterday, after reaching 96.28, the highest level since March 30. The dollar was at $1.3022 versus the euro from $1.3036. Mexico’s currency was at 14.0390 versus dollar from 14.0505 yesterday and fell to 6.874 versus the yen from 6.860. The Mexican peso fell yesterday against all of the other major currencies tracked by Bloomberg as the government closed schools until May 6 and shut public events to contain the swine flu. The currency dropped 5.1 percent yesterday against the greenback to the weakest level since April 1. It was the biggest decrease since Oct. 15. The euro declined yesterday for the first time in five days against the dollar before next week’s meeting of the European Central Bank, at which policy makers will announce whether they intend to take additional measures to push down borrowing costs. Investors in the past week increased bets the ECB will reduce its 1.25 percent target lending rate at its May 7 meeting. The implied yield on the three-month Euribor interest-rate futures contract for June delivery fell to 1.295 percent yesterday from 1.325 percent a week earlier. ECB President Jean-Claude Trichet said in New York yesterday that 2009 will be a “very bad year” for the euro region’s economy and a recovery will only emerge next year. FKLI April futures contract plunge 15 point lower to close at 982 as compare to previous trading session with total 14,425 lots traded in the market. FKLI was traded lower after fail to breach psychology levels at 1000 regions. Technically, FKLI plunge after fails to hold above previous resistance levels at 1001 regions. We expect FKLI shall undergo some correction phase after 6 – consecutive week of bull rally provided resistance levels at 1001 and 1011 were not violated. Traders were advice to hold short position in the coming trading session while be cautious around support levels at 970 and 950 regions. FCPO 3rd month July Futures contract plunge RM104 lower to close at RM2481 as compare to previous trading session with 12,820 lots traded in the market. CPO price plunge after soybean oil and crude oil electronic trading plunge before CPO starts trading. Technically, CPO price was traded sideways throughout entire trading session within down trend channel range from RM2480 and RM2500 regions. We expect CPO price would trade lower in the coming trading session provided while support levels were seen around RM2350 and RM2300 regions. Traders were advice to hold short position in the coming trading session while be extra cautious around resistance levels at RM2537 and RM2580 regions. MUMBAI, April 27 (Reuters) - Indian oilseed futures may trade lower on Monday tracking weakness in Malaysian palm oil futures, analysts said. Soybean is crushed to produce soyoil and palm oil is used as a substitute for soy oil. India is a major importer of edible oils. The June soybean contract NSBM9 on the National Commodity and Derivatives Exchange last ended at 2,739.5 rupees per 100 kg, down 2.4 percent. The June soyoil NSOM9 closed down 0.39 percent at 506.05 rupees per 10 kg. At 9:26 a.m. the benchmark July palm oil futures KPOc3 on Bursa Malaysia Derivatives Exchange was down was down 3.75 percent at 2,488 ringgit a tonne. PARIS/SINGAPORE, April 24 (Reuters) - Chicago corn and wheat futures were little changed in hesitant trade, after the previous day's rises on concerns about spring planting delays in the United States due to wet weather. "A reduction in corn acres and maybe some small switching into soybeans, that is the possible outcome from the wet weather," said Adam Tomlinson, commodities analysts with Rabobank in Sydney. BEIJING, April 24 (Reuters) - The Chinese corn market anticipates the government may release its reserves soon after the current stockpiling plan is by the end of the month, said an official think tank. The China National Grain and Oils Information Centre (CNGOIC) gave no details, but said most enterprises surveyed had agreed that the government would sell reserves to maintain a steady supply after farmers in the northeast sold their harvests. WARSAW, April 24 (Reuters) - Polish grain prices are slipping on the back of strong supply and low demand, analysts and producers said on Friday. Data from the Ministry of Agriculture on April 19 showed milling wheat traded at 549 zlotys per tonne, a drop of 0.8 percent from the previous week, while the price of feed wheat remained unchanged at 463 zlotys. SYDNEY, April 24 (Reuters) - Australian farmers are likely to have sold more than 85 percent of the 2008/09 wheat harvest that ended in February, yielding about 21.4 million tonnes, as a weaker currency boosted the grain's appeal, traders and analysts said on Friday. At most about 15 percent, or around three million tonnes, remained unpriced, stored on farms, they said. HANOI, April 24 (Reuters) - Vietnam's food industry and government trade officials have agreed to allow rice exporters to resume talks to sign new deals, effectively lifting curbs in place since late February, an official said. The move looks set to swell a tide of rice supplies after news this week that largest producer Thailand plans to sell 3.76 million tonnes from stocks and signals emerged that India, which competes with Vietnam to be the second-largest producer, could lift a rice export ban after May national polls. SYDNEY, April 24 (Reuters) - Chances of good April to June rains in croplands across southeast Australia remain slim, giving farmers little hope of a break in a long-running drought as they head into the planting season. Australia's Bureau of Meteorology said on Friday the region had a 60-75 percent chance of drier-than-normal weather over the three-month period. JAKARTA, April 24 (Reuters) - Malaysian crude palm oil futures edged up to a 34-week high on expectations that data due out Monday would show good palm oil exports during the first 25 days of April, traders said. "It was a very healthy correction towards the closing. Traders may have realised that the exports rise has been priced in," the trader said. BEIJING, April 24 (Reuters) - China's commerce ministry warned on Friday about potential risks as China's soybean and rapeseed imports in April approach record levels. The large imports may cause an oversupply in the country because harvesting is about to begin for the new domestic rapeseed crop, while demand for cheaper palmoil is expected to pick up as the weather gets warmer. KUALA LUMPUR, April 24 (Reuters) - Malaysia's palm oil prices are likely to touch 2,600 ringgit ($716.2) a tonne and may remain at that level till August as robust demand cuts into declining stocks, the state news agency reported on Friday, citing an industry body. The inventory drawdown from 2.2 million tonnes in November to 1.36 million tonnes in March was due to an aggressive replanting scheme initiated by the government, Malaysian Palm Oil Board director-general Mohammad Basri Wahid was quoted by Bernama as saying. JAKARTA, April 24 (Reuters) - Indonesia retained its zero percent palm oil export tax in May, while raising the crude palm oil base export price to $560 per tonne from $515 per tonne in April, a trade ministry official said on Friday. Indonesia does not tax palm oil exports until the minimum reference price hits $700 a tonne. April 26 (Bloomberg) -- OPEC and 13 Asian countries urged greater oversight of oil and other commodity markets to prevent a surge in prices after the global economy recovers from the worst recession since World War II. Participants in a ministerial energy roundtable in Tokyo sought limits on positions in over-the-counter trades and said “excessive” oil-price movements are “undesirable,” according to a statement released after today’s meeting. They also called for “continuous” investments to boost energy supplies. Asia’s biggest oil users met the world’s largest producers to discuss ways to revive spending and ensure stability in energy prices and supplies after the recession ends. Last year, the U.S. Commodity Futures Trading Commission initiated an investigation to determine whether crude prices reached record levels because of manipulation. The Organization of Petroleum Exporting Countries unveiled a plan in January seeking regulations to cap speculative trading by investors who buy oil without planning to use it. Oil futures in New York have gained 16 percent this year and are still 65 percent below the record $147.27 a barrel reached in July 2008. The U.S. House Agriculture Committee in February approved legislation that would place limits on positions a trader can hold in commodity markets as the government seeks more control over derivatives. At present, such limits on speculative positions exist only for agricultural products. The bill would also enhance the U.S. Commodity Futures Trading Commission’s oversight of credit-default swaps. At a meeting in London this month, policy makers from the Group of 20 industrial and emerging economies called for stricter limits on hedge funds, executive pay, credit-rating firms and risk-taking by banks. Qatari Oil Minister Abdullah bin Hamad al-Attiyah and Japanese Trade Minister Toshihiro Nikai co-chaired today’s roundtable, and delegates included Saudi Arabian Oil Minister Ali al-Naimi and International Energy Agency head Nobuo Tanaka. “We are not yet certain how we will create and control” limits on trading positions,” al-Attiyah said at a press conference in Tokyo. OPEC and Asian governments would need to watch what measures are adopted by the G-20, he said. “We will take actions to avoid any excessive volatility in commodity futures, and Japan will look into what measures are appropriate,” Nikai said at the briefing. He said oil producing and consuming countries must “join forces” to tackle “supply issues” that may emerge after the world economy recovers. Paris-based IEA said yesterday falling investments in production may result in a global oil shortage by 2013. Ministers at the roundtable said oil-producing and consuming countries must stem a decline in exploration and output. “The drying up of liquidity to fund projects underpinning economic growth in emerging and developing economies has been a significant consequence of the recession,” Saudi Arabia’s al- Naimi said in the text of a speech at today’s meeting. OPEC members have delayed 35 drilling projects, the Wall Street Journal reported on Feb. 10, citing the group’s Secretary General Abdalla Salem el-Badri. Saudi Arabia and Kuwait have called off or deferred ventures to find new fields, expand existing wells, and build refineries, according to Japan’s trade ministry. Falling investment “is of great concern, notably for energy-sector projects adversely affected by oil price volatility and lower demand for oil, when long-range commitments of adequate and timely investment flows are needed to ensure future supply,” al-Naimi said. OPEC, supplier of about 40 percent of the world’s crude, faces a 51 percent plunge in net oil revenue this year, according to the U.S. Energy Department, which estimates the group will earn $476 billion. Spending on new energy production is likely to decline around 20 percent this year, according to the IEA, the Paris-based adviser to 28 nations. The Asian Energy Ministerial Roundtable meeting is held every two years. The group last met in Riyadh, Saudi Arabia, in May 2007. April 26 (Bloomberg) -- OPEC, supplier of 40 percent of the world’s oil, will reduce oil production if necessary to support prices, Secretary General Abdalla el-Badri said. Production cuts by the Organization of Petroleum Exporting Countries since September have failed to raise oil prices to the $70 a barrel sought by members including Venezuela as the global recession erodes demand. The average price in the first quarter was $43.32 a barrel, 56 percent lower than a year earlier. The 12-nation group will meet May 28 in Vienna. The oil market is oversupplied because of production increases from non-OPEC countries even as OPEC members reduce output to stem a price slide, Algeria’s Oil Minister Chakib Khelil said. Oil traded in New York, which reached a record $147.27 a barrel in July, ended last week at $51.55. “There is an oversupply of 720,000 barrels and it should be cleared,” Khelil told reporters in Algiers today. “Non-OPEC countries did not help us to stabilize prices,” he said, adding that some countries had increased their production by 500,000 barrels a day. Crude at $50 a barrel is not enough to meet investment needs, el-Badri said. The price needs to be at $70, he said. Crude prices may reach $60 a barrel by the end of 2009, Khelil said. OPEC agreed last year to cut output by 4.2 million barrels a day, setting a production target of 24.845 million barrels a day for its 11 members with quotas. Iraq can produce at will. The 11 countries with quotas pumped 25.567 million barrels a day in March, OPEC said in its monthly report on April 15. Ul- Haq said Iran and Venezuela are producing above their assigned targets. Compliance is “excellent” at 83 percent, el-Badri said. It needs as much as 90 percent compliance and oil prices may fall further if OPEC members don’t comply, he said. Crude reached $32.70 a barrel on Jan. 20. Saudi Arabia, OPEC’s biggest producer, is “under pressure” from members including Libya, Iran, Venezuela and Algeria, to cut output at the May meeting, former Saudi Arabian Oil Minister Sheikh Ahmad Zaki Yamani said. OPEC and 13 Asian countries urged greater oversight of oil and other commodity markets to prevent a surge in prices after the global economy recovers from the worst recession since World War II. The International Energy Agency, adviser to 28 industrialized nations, reduced its 2009 global oil demand forecast on April 10 for an eighth month to the lowest level since 2004. The IEA expects consumption to fall by 2.4 million barrels a day, or 2.8 percent, to 83.4 million barrels a day this year. April 27 (Bloomberg) -- Crude oil fell for the first time in five days in New York on speculation a slow recovery from the global recession may limit demand. The U.S. economy, the world’s largest oil consumer, will continue to contract “for some time,” Lawrence Summers, director of the White House National Economic Council, said yesterday. Increased output by non-OPEC producers has left the market oversupplied by about 720,000 barrels a day, said Algerian Oil Minister Chakib Khelil. Crude oil for June delivery fell as much as 80 cents, or 1.6 percent, to $50.75 a barrel in after-hours electronic trading on the New York Mercantile Exchange. It was at $50.78 at 7:54 a.m. in Singapore. The contract jumped 3.9 percent to $51.55 a barrel on April 24 as a weaker dollar and rising equity prices boosted investment in commodities. Oil gained $5.67 in its first four- session rally in a month, trimming the weekly decline to 1.8 percent. Crude prices need to be at $70 a barrel to ensure continued investment in the industry, Abdalla el-Badri, secretary-general of the Organization of Petroleum Exporting Countries, said in Algiers yesterday. Oil may reach $60 a barrel by the end of 2009, Khelil said. OPEC pumps about 40 percent of the world’s oil. The group agreed last year to cut output by 4.2 million barrels and will review production again when it meets May 28. Saudi Arabia, the biggest producer, is under pressure from the rest of OPEC to cut output further, the Kingdom’s former oil minister Sheikh Ahmad Zaki Yamani said in Cairo yesterday. Brent crude for June settlement fell 52 cents, or 1 percent, to $51.15 a barrel on London’s ICE Futures Europe exchange. It climbed $1.56, or 3.1 percent, to $51.67 a barrel on April 24. The world’s 20 largest nations will spend $820 billion to shore up their economies this year and $660 billion in 2010, the International Monetary Fund said yesterday. The biggest effect from the measures may come toward the end of this year, an IMF official told reporters on condition of anonymity. Expectations of that recovery have been reflected in equity markets, which have in-turn supported crude prices, Hassall said. While physical demand remains weak, oil prices may climb “toward $55” a barrel if stock prices can extend their gains. “But it’s a bit of a stretch given we have very high levels of inventory, which are still rising,” he said. U.S. oil stockpiles rose for a seventh week to 370.6 million barrels on April 17, the highest since September 1990. Hedge-fund managers and other large speculators are betting on declining New York oil futures for the first time in six weeks, according to U.S. Commodity Futures Trading Commission data. Speculative net-short positions, or bets prices will fall, outnumbered long positions by 14,605 contracts on April 21, the Washington-based commission said April 24. A week earlier, traders were net-long 4,962 contracts. April 27 (Bloomberg) -- The yen rose for a fourth day against the dollar after Lawrence Summers said the U.S. economy will keep shrinking, boosting demand for the Japanese currency as a refugee from a recession. The yen rose to 96.75 yen against the dollar as of 8:43 a.m. in Tokyo from 97.17 in New York on April 24. The Japanese currency advanced to 127.90 per euro from 128.66. The dollar traded at $1.3222 from $1.3242 last week. 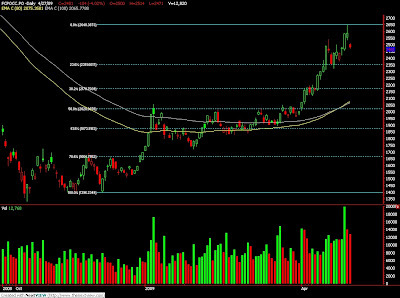 The yen may strengthen to 90 per dollar by the middle of next month, Uno said. “The outbreak of swine flu may have a psychological but negative impact on the dollar given the geographical proximity of the U.S. and Mexico,” said Ryohei Muramatsu, manager of Group Treasury Asia in Tokyo at Commerzbank AG, Germany’s second-largest lender.